Finding an environmentally friendly, sustainability-focused hotel in Frankfurt, Germany’s business and finance metropolis, can be a daunting task. In fact, chances are your online search will get you to the one (and only?) place it led us to: a small, independently owned business hotel with the alluring name of Villa Orange. 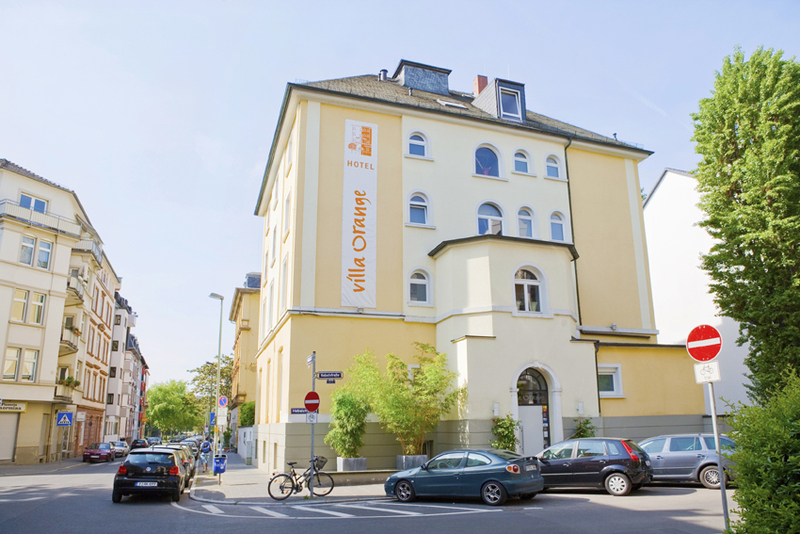 A little green oasis amidst Frankfurt inner city suburbia, Villa Orange – which forms part of the Bio-Hotel association – offers its predominantly business guests a healthy, organic diet in a relaxed, eco-friendly ambiance. This, of course is just what we need on our one-night stopover in Frankfurt, traveling from Dubai to Tallinn, Estonia. Spoiled but with the usual cold after our 7-hour flight with Emirates, the canopy bed (see picture) in our comfy first floor room is where we cure our jet lag. Still a bit sleepy next morning, we walk into Villa Orange’s small and accommodating breakfast restaurant, where we are greeted with a buffet so varied and yummy that – an hour later – we have difficulties of letting go. Yet, move on we must. A quick chat with the friendly receptionist during check-out and back on the road. The 10-15 minutes walk to the S-Bahn station easily manageable, even with our heavy bags. 15 minutes later we are back at the airport. But can a hotel be eco-friendly, bio/organic and make good business sense at the same time? A question we asked Christiane Huette, owner-manager of Villa Orange. “What was important to me privately, I also wanted to implement in my company,” Christiane Huette tells us. In 2006, she started to search for organic suppliers, with 95 per cent of all food produce in bio (organic) quality only two years later. And, when Villa Orange became part of the Bio-Hotels marketing association in 2009, produce offered at the hotel became 100% organic, including all drinks. Popular nougat cream Nutella was the last non-organic item to be banned from the hotel’s breakfast buffet. For those not yet familiar with the concept, Bio (organic) Hotels are a community of values and a marketing association of around 90 hotels predominantly in the German-speaking world (Germany, Austria, Switzerland), with headquarters in Austria. All Bio Hotels are privately owned, which, as Christiane Huette points out, makes them “as different and unique as their owners.” In fact, in her view, its diversity makes this little cooperation so special, with Villa Orange as a business and city hotel the clear exception from the mostly rural properties. Because the building used by Villa Orange is from the 1900s, with an addition from the 1960s, the hotel cannot claim a degree of “green” building standards such as the purpose-built Crowne Plaza Copenhagen Towers, for example. Rather, the focus is on offering exceptional organic breakfast and the organic food supplied at meetings and events in the hotel’s conference facilities. In addition, natural cosmetics are used in the bathrooms, towels and linen are made from organic cotton, only organic cleaning detergents are used, recycled paper is used in the hotel office, and whenever possible, energy-efficient LED have already replaced conventional bulbs. Moreover, the hotel gets its electricity from renewable energy sources. Being a business hotel, some amenities, such as TV and wireless internet, cannot be entirely avoided, the friendly hotel manager tells us, which of course causes some smog. On the other hand, the average length of stay at Villa Orange is 1.5 nights, and the availability of fast internet a clear knockout criterion for busy travelers. 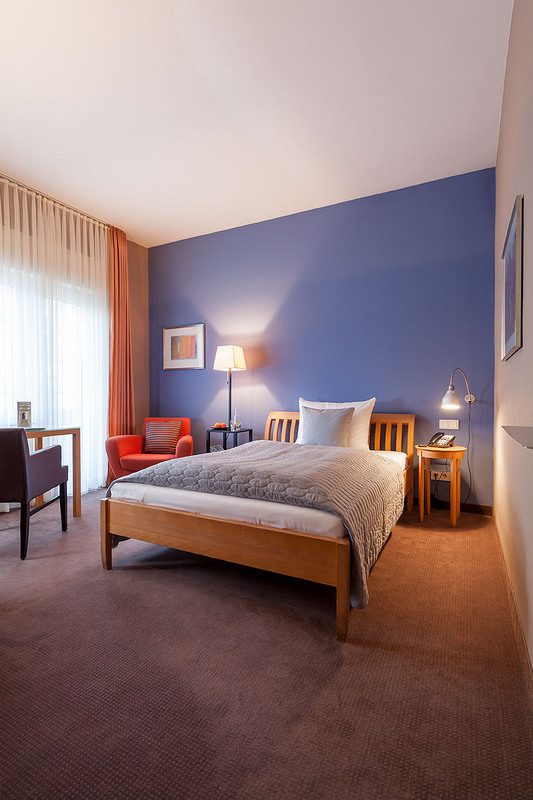 Like our review of business hotel Villa Orange in Frankfurt, Germany? Share and spread the word!